Diamond Details: Round brilliant cut white diamonds of G-H color SI clarity, weighing .86 carat total and brilliant, yellow diamonds, weighing .17 carats total. Ring Details: Simon G 18k white and yellow gold design with antique style caviar beading. Accommodates a 3.50 carat round cut center stone. 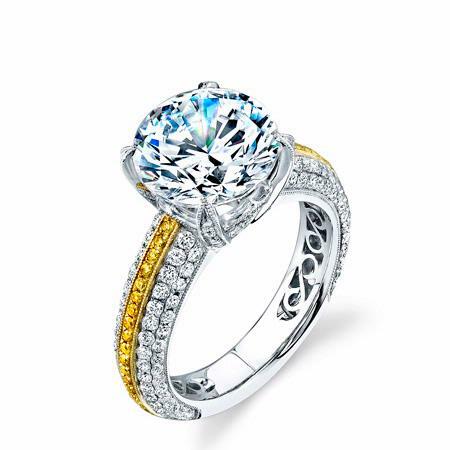 This stunning Simon G antique style 18k white and yellow gold engagement ring setting features round brilliant cut white diamonds of G-H color SI clarity weighing .86 carat total and brilliant, yellow diamonds, weighing .17 carats total. Caviar beading creates the unmistakable antique style effect. Accommodates a 3.50 carat round cut center stone. Simon G rings may be ordered to any finger size. Simply allow 3-4 weeks for delivery. We carry an extensive selection of separately sold G.I.A. certified diamonds to nestle onto the center of your beckoning setting. View our inventory of loose certified diamonds. Please contact us for pricing: 1-800-790-6980 or 1-212-302-2863, info@firenzejewels.com.